I did not grow up on biscuits. The only biscuits my mother ever made came from a can. She was a great cook and made many delicious recipes, but she didn't really bake. My husband brings up almost every Christmas about the year she took my great brownie batter and added a bag of raspberry chips to it. They were pretty inedible. Needless to say I had no idea how to make biscuits when I moved 2500 miles away from home to the State of West Virginia. Biscuits are a big deal in this state. I quickly learned that knowing not only how to make a biscuit, but being able to whip up a batch on the fly was an essential part of being a West Virginian. Since my husband and I met and got married in graduate school I quickly realized I was in trouble. My first few biscuit attempts were disasters. I kneaded the dough, I rolled out the biscuits with a rolling pin and they resembled hockey pucks. After a few years my mother in law took pity on me and kindly asked me if I could help her with her breakfast biscuits. In reality she very nicely pointed out everything that I was doing wrong without it feeling like a baking lesson. It worked, the next time I made biscuits they were perfect, they rose beautifully, they had a great texture and my husband would eat them (which is saying a lot I promise). Now she still makes the best biscuits I have had in this state and every time my husband goes home she makes him a big batch. They are the only biscuits that he never adds any jam or butter to, they are perfect as is. So I concede to coming in second best, a place which I think is pretty great considering the competition. I make a number of biscuit recipes depending on if they are for breakfast or as a side. Today I tried a new recipe for Salt and Pepper Biscuits from the November 2013 issue of Bon Appetit magazine. This recipe has 8 ingredients. It takes 30 minutes of total time, 20 minutes of which is active and makes 8 biscuits. I made few very changes to the original recipe. The main changes were to the execution of the recipe steps. The recipe states to use a food processor to cut in the butter. While I love food magazines, this is a step I have to debate. I have always cut my butter in by hand with my fingers and so does my mother-in-law. It keeps the butter a great texture and the flavor is always perfect. I cut the butter into small pieces and rub it into the flour mixture with my fingers. It should resemble a lumpy batter when done. 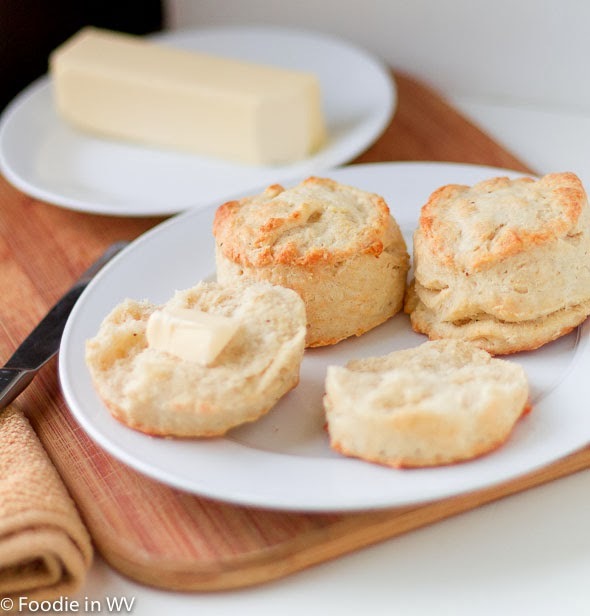 You want these butter lumps in order to have flaky, buttery biscuits. The other big change I made was to roll out my biscuits by hand. Do not roll out biscuits with a rolling pin, it makes for flat biscuits. I pat out my biscuits with my hands and then use a biscuit cutter. Avoid too much contact with the dough in general, the less you touch it the better the biscuits. These biscuits are definitely dinner biscuits. I served them alongside a veggie smoked salmon chowder recipe and they worked well together. As a breakfast biscuit they would not work as well, so remember that these should be a lunch or dinner biscuit/bread. 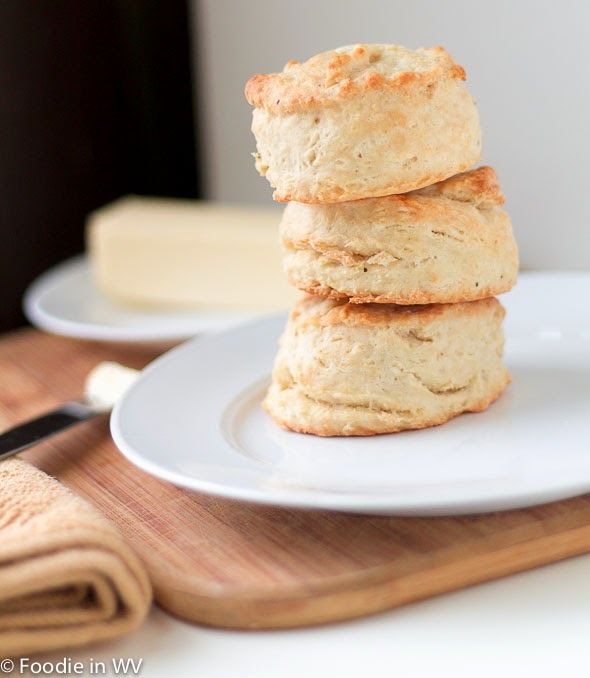 With a little bit of butter my whole family liked this biscuit recipe. My husband still prefers breakfast biscuits, but he may be the pickiest biscuit eater I have ever met so his opinion is a little biased. Overall, these were easy to prepare and were a nice side with soup. For the recipe go to Salt and Pepper Biscuits. Gorgeous biscuits, Ann. They look melt-in-mouth delicious! Thanks :) They turned out really fluffy and the texture was great! Honestly, I have never made biscuits from scratch, either. My family barely appreciate he ones from the can, so I don;t bother wasting my time making stuff they won't eat. They are pretty easy once you get the hang of it. My husband and boys are pretty biscuit picky though :) I wouldn't make them if my kids didn't eat them either! I'm so bad at biscuits...I usually used the canned type or Bisquick when I'm feeling fancy. Ha. These sound excellent and I will keep them in mind. I have used the frozen ones many time, so don't feel bad :) These are actually really easy, which is nice! I used to be really bad also :) I use the frozen ones when I don't have time to make them from scratch. Oh man, my tummy was already grumbling, now I'm lost!! These look DELICIOUS!! I haven't had a great homemade biscuit since my gram passed. Thanks for the sweet comments :) My MIL was very sweet when she helped me, she always is! Wow! What can I say? ... I must eat them! Amazing job! Looks sooo yummy! Thanks :) I would share if you lived closer! Hi Ann, I stumbled across your blog when trying to research the origin of Salt & Pepper Biscuits. I am a German food blogger (well, just started six months ago) and just now would like to take part in a blog event on American food. In the November issue of "Bon Appétit!" I just fell for the S&P Biscuits picture and recipe, I tried to find out more about them - and that's how I got here. And thought it was quite funny you tried the same recipe… :) Anyway: I love your blog and will add it to my feed reader straight away! Love from Germany, Barbara. It was a great recipe, my family loved it :) Thanks for stopping by, I am going over to check out your page now! I love supporting other food bloggers, especially since it can be hard when you first start. Come back again soon!